How do I Unlock my Game? The first time you launch the game, you will see a screen like the one below. It will prompt you for a verification code. This process ensures that you’re using the right Bomb Defusal Manual version. The verification code is found on the title page of the Bomb Defusal Manual. You can print or save this version of the manual to continue using it each time you play, until the game requires a new manual version. 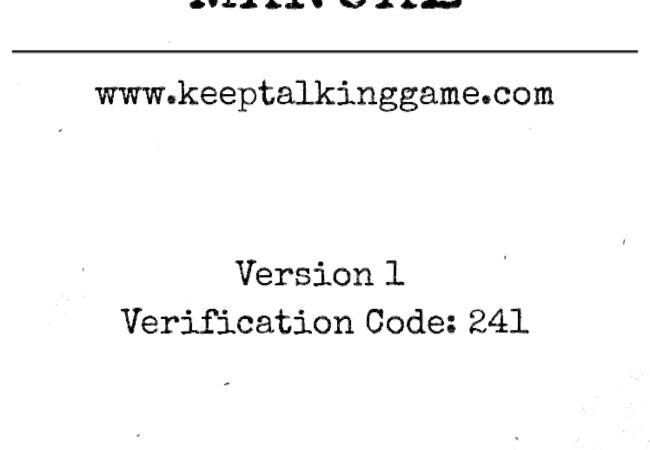 When a new version of the Bomb Defusal Manual becomes available, you will need to unlock your game again by providing the new manual's verification code. This makes it easy to know when you need to reprint or download a new Bomb Defusal Manual version. Keep Talking and Nobody Explodes is a local multiplayer party game for two or more players. The objective of the game is defuse a bomb before time runs out by using the instructions found in the Bomb Defusal Manual. One player, in virtual reality, takes the role of the bomb Defuser. All other players take the role of Experts who must use the Bomb Defusal Manual to guide the Defuser through the challenging task of defusing a bomb. Daydream View headset and controller (Bluetooth gamepad also supported). Play locally with friends in the same room or play remotely using your favorite voice chat service. Any number of players can participate as Experts: it's up to the Experts to work efficiently as a team! A copy of the Bomb Defusal Manual in paper or digital form.